After dealing in backto-back premierships in recent years, the Hawks have back-to-back wins for the first time this season. Hawthorn was on top on the inside (contested possessions 148-131) and outside (kicking efficiency 72 to 62 percent). Tom Rockliff now off the ground with a shoulder injury, after having a careerhigh 16 clearances, a game-high 21 contested possessions, 13 tackles and seven score involvements. 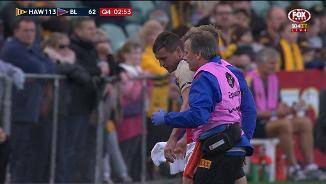 Lions InterchangeTom Rockliff and is possibly out for the game. Ryan Burton has produced another impressive display for the Hawks. He has had 25 disposals at 88 percent efficiency, and 445 metres gained (second most for the Hawks). With the Lions tiring, the Hawks have kicking efficiency of 89 percent in the final quarter, including a return of 6.0. (36) from shots at goal. The Hawks have five goals in a row now, and during this period the Lions have had only one effective kick. The Hawks lead the clearances 81 in the final quarter, and have had the last seven inside 50s to put an end to any Brisbane resistance. The Hawks are continuing to edge the Lions in scores from stoppages (3926), despite the clearances being even. Hawthorn able to immediately answer the Brisbane goal with the first goal of the game to come from a centre bounce clearance. This season Brisbane has allowed its opposition to generate a score from 34 percent of centre bounce chains (ranked last). Brisbane eventually does get the first goal of the final quarter, with a good passage of play taking the ball from its defensive 50. All three of the Lions defensive 50 chains in the final quarter have generated a forward 50 entry. Brisbane has generated scoring opportunities in the final quarter (inside 50s 52), but has failed to convert its first two chances in front of goal. An excellent oneon-one win by Ryan Burton denies the Lions the opening goal of the final quarter. The Hawks lead 12-7 in one-on-one contest wins. Hawthorn lead the inside 50 count (4132), but have a major advantage in forward 50 marks (15-4), indicating the quality in its forward entries. In the third quarter, the Hawks edged the Lions at the contest (3630 contested possessions), and used the ball more effectively (leading effective kicks 37-20). Hawthorn was again able to pull away late in the quarter, with the final five scores of the game giving it a gamehigh 29 point lead. Hawks InterchangeCyril Rioli and is possibly out for the game. In a sign of the problems the Lions have had with ball movement, they have only been able to generate two inside 50 entries from 34 defensive 50 chains. Brisbane having difficulty clearing the ball from its defensive half, with Hawthorn able to generate four consecutive inside 50s capped with the Henderson goal. Brisbane getting a goal from a stoppage via another Rockliff clearance. In this quarter, he now has nine clearances (the most by any player in a quarter this season), and four score involvements. 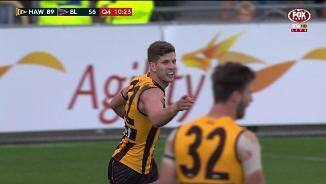 Hawthorn now has four of the last five goals and a gamehigh 20 point lead. Brisbane has kicking efficiency of just 43 percent this quarter which has undone its 126 advantage in clearances. Tom Rockliff gets a vital goal for the Lions following a free kick off the ball. The Lions have now scored 3.2. (20) from free kicks, while Rockliff is up to a massive 14 clearances (no other play has more than five). Hawks InterchangeBen Stratton and is possibly out for the game. Brisbane has continued to apply good pressure, and lead in forward 50 tackles (128), overall tackles (61-46) and smothers (9-4). The Hawks get a goal from their first inside 50 of the quarter to punish Brisbane who missed its chances. Hawthorn now lead in scores from stoppages (2014), despite Brisbane leading in effective clearances (25-17). In this quarter, the Lions lead the clearances (42) and inside 50s (5-0), but have not been able to score a goal from this period of control. Tom Rockliff leads all players for contested possessions (13) and clearances (ten), and has also applied seven tackles in another industrious performance. The Hawks have been outscored by an average of 22 points in the third quarter this season, which is the worst quarter by any team this season. The Hawks have already taken 15 intercept marks at half time, and have only averaged ten such marks per game this season. A better quarter from the Lions, but the Hawks with the last two goals of the quarter, have been the better team in the first half. Hawthorn has controlled the ball (marks 6132), and used the ball better in the forward half (forward 50 marks 10-2). A contested mark and goal to Ben McEvoy gives the Hawks a handy 15 point lead. The Hawks now lead in contested marks (84) and forward 50 marks (10-2). Brisbane lead in ballup clearances (13-4) and has scored two goals to nil from this source. 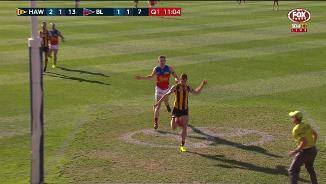 Hawthorn lead in throw-in clearances (11-3) and has scored two goals to nil from this source. Luke Hodge had disrupted much of the Brisbane ball movement with four intercept marks and a teamhigh five tackles. Lions InterchangeTom Rockliff off due to an injury. Another forward 50 chain goal to the Hawks, this time from a stoppage. Isaac Smith now has two goals and a teamhigh 255 metres gained. The Lions have applied very good tackling pressure. They lead in tackles 4634 and have made 88 percent of the tackles attempted, while the Hawks have tackle efficiency of 74 percent. Luke Breust unable to convert a set shot after a strong mark in the forward 50. The Hawks have scored 0.3. (3) from set shots while Brisbane has scored 2.0.(12). Finally Brisbane is able to move the ball from its defensive half to generate a score. The Lions have been able to halt the Hawks ball movement better this quarter, and lead in kicking efficiency 62 to 45 percent. Both teams are continuing to struggle with their ball movement, and only one goal in the game has not come from a forward 50 chain. Brisbane has already recorded 13 clanger kicks. The AFL average is 21 per game, and the Lions average 25 (the second most in the competition). Brisbane able to make the most from a chaos passage of play and score its third goal of the game from a forward 50 chain. A sloppy start to the second quarter with multiple kicks going out on the full, and both teams having kicking efficiency of only 50 percent. Hawthorn has the first four inside 50s to start the second quarter, with the Lions struggling to move the ball into their half. With contested possessions and clearances relatively even, the Hawks had the better of the opening term with an advantage in effective kicks (4328), intercept marks (8-0) and forward 50 marks (4-0). Brisbane has generated 23 percent of its score this season from forward 50 chains (ranked second). Both of its goals today have come from such a source. While Brisbane shaded Hawthorn 1110 in inside 50s, the Hawks lead forward 50 disposals 22-11, with the Lions midfield struggling to connect with their forwards. Both of the Brisbane goals have come from free kicks, and it is still to take a mark in its forward 50 (and trails in overall marks 1432). 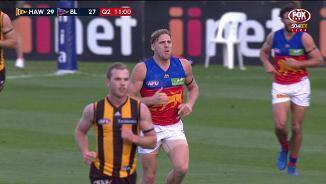 Another defensive 50 turnover by the Lions in punished by Hawthorn. The Hawks have now scored 2.1. (13) from this source today, having averaged just eight points per game in this manner. The Hawks pressure is helping them lead in intercept marks (60), and their better ball use has given them an advantage in forward 50 marks (3-0). Hawthorn starting to control the ball better than Brisbane (lead in marks 186), and punish the Brisbane turnover in transition for its second goal. The Hawks get their opening goal of the game from a forward 50 stoppage. Hawthorn has averaged just 23 points per game from stoppage clearances this season (ranked 17th). Brisbane has four of the first five inside 50s and the opening goal to start the game through a free kick. The Lions have had some slow starts this season, and been outscored by an average of ten points in first quarters (ranked 16th). Tom Rockliff with a good early spoil to deny Jarryd Roughead a forward 50 mark. Roughead has won 48 percent of his offensive oneon-one contests this season, which is the second-highest percentage recorded by a player with 20 or more such contests. Tom Rockliff has been good this season for the Lions, averaging careerhighs for contested possessions (14), inside 50s (five) and clearances (nine). Ben McEvoy has won a hitout at 52 percent of his ruck contests this season (he has previously never won more than 40 percent in a season). He also has careerhighs for hitouts to advantage (9.6), score involvements (5.4) and goals. Brisbane has directed 22 percent of its defensive 50 rebounds through the corridor (ranked fourth), while in contrast the Hawks have directed only 14 percent of their rebounds through the corridor (ranked last). These two teams have struggled winning contested ball this season. Brisbane has conceded 10 more contested possessions to its opposition per game (ranked 17th), while the Hawks have conceded 18 more contested possessions (ranked last). Welcome to University of Tasmania Stadium for the Hawthorn v Brisbane Lions Round 8 clash. 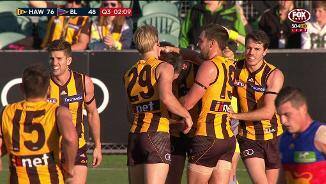 Hawthorn face a nervous wait to find out how long Cyril Rioli will be sidelined, with the four-time premiership star suffering a knee injury in the Hawks' 38-point AFL win over Brisbane in Launceston. Rioli limped to the bench after crashing into Josh Walker with his left knee in a desperate spoiling attempt and didn't reappear after three-quarter time in Saturday afternoon's 17.11 (113) to 11.9 (75) win. The Hawks were left counting the cost of their third win of the season after premiership defender Ben Stratton also went off with a knee injury and was unable to see out the game. 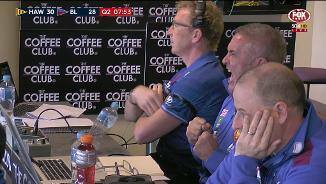 "By and large, we're pleased with the win but lick our wounds a bit," coach Alastair Clarkson said. 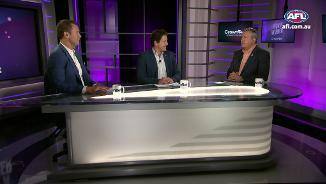 "We've got a couple of injured boys late in the game, so we'll just have to see how they come out of their scans early next week to determine the extent of their injuries. "(Cyril's) is a PCL mechanism and we've just got to hope that it's not a severe injury but we've just got to see what's happening with a scan. "But I'd suggest he'd be highly unlikely to play next week." Adding to Clarkson's concerns, winger Isaac Smith was reported for striking Nick Robertson, who applied a hard tag to Smith, in the third quarter. The Lions didn't escape unscathed either, with former skipper Tom Rockliff dislocating his left shoulder in the final term. Clarkson's men have struggled to close out games this season, but they led by 29 points at three-quarter time and made sure of the points with a burst of five unanswered goals in the last quarter. The Lions hadn't beaten Hawthorn since round 12 of the 2009 season, with that losing streak extended to eight matches by Saturday's result. Tom Mitchell was prolific again with 36 possessions for the Hawks, while former Adelaide utility Ricky Henderson enjoyed his best game for his new club with 21 touches and three goals. Experienced hands Dayne Zorko and Rockliff led the way for Brisbane with 31 and 30 disposals respectively, while ruckman Stefan Martin had 63 hitouts in a stoppage-heavy affair. 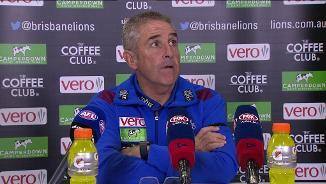 "I thought we were really competitive in the first quarter and just a couple of mistakes gave them goals," Brisbane coach Chris Fagan said. "It was a pretty intense struggle at that time. 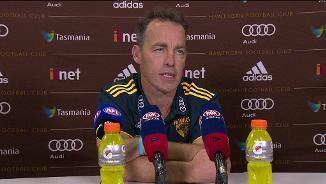 I thought our effort for most of the day was good but, with those mistakes, Hawthorn are a classy outfit and they'll make you pay every time." The last-placed Lions slip to a 1-7 record with the loss and host Adelaide next Saturday night at the Gabba. 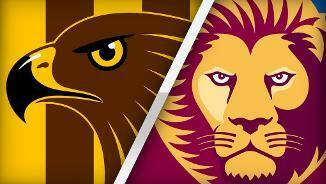 Hawthorn improve to 3-5 and take on Collingwood, also on Saturday night, at the MCG. 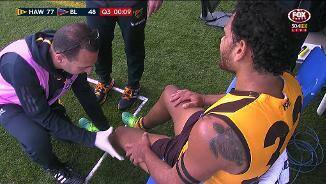 Hawthorn: Knee injuries to Ben Stratton and Cyril Rioli marred the day for the Hawks. Both didn't appear in the final quarter. Brisbane Lions: Acting captain Tom Rockliff hurt his shoulder in the final few minutes and had to have it put back into place by the team doctor. The Hawks are back at the MCG on Saturday night, facing Collingwood, who they haven’t lost to since the 2011 Preliminary Final. 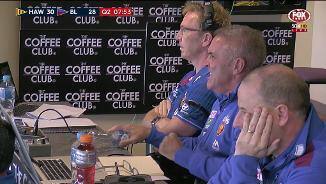 The Lions host Adelaide at the Gabba, also on Saturday night. Reports: Isaac Smith (Hawthorn) reported for striking Nick Robertson (Brisbane Lions).